During the first quarter of the Premier League season the Di-Cannio era at Sunderland has predictably ended in tears and Ian Holloway has departed from Palace. 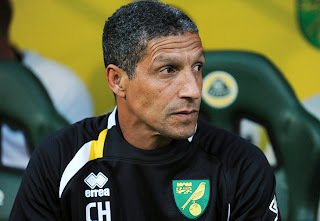 The hunt is now on for the next Premier League Manager that to use the cliche is under pressure and it would appear Norwich's Chris Hughton is the name in the frame. The Canaries have just been on the wrong end of a 7:0 thrashing at Manchester City and are currently sitting third from bottom of the Premier League so there is a certain logic given the team's mixed fortunes. It is almost pointless to ask if it is it fair. Ditching coaches in the Premier League has an almost inevitable rhythm there is a cycle where there is always a club in crisis and that club's manager is just a handful of games from the sack. Going into the weekend there were a number of candidates for being the crisis club Fulham and Newcastle being among the alternatives . All were playing clubs that were far stronger than themselves and could suffer heavy defeats. Unfortunately for Hughton, Newcastle managed an unlikely win against Chelsea and while Fulham lost it was not a complete rout. So Norwich are this weekend's crisis club and Hughton has to face questions from the Match of the Day interviewer about whether or not he is the right man for the job. What has happened at Norwich? Having survived in the Premier League for two seasons with a relatively modest squad mostly recruited from the Championship Norwich spent big in the summer to kick on to the next level. Unfortunately for Norwich they cannot compete with those teams with £100m plus wage bills and there is an absolute limit to the quality of player they can attract and it will never be enough to lift them out of the Premier League's mid table mix. For teams like Norwich the reality is they will never be more than about 3 defeats away from a flirtation with the relegation places and that is their lot. The summer's activity has raised expectations but equally the turnover in players has disrupted what was a tight nit unit and the newcomers are still adjusting to life in a new league and in many cases a new country. All of which has probably had a negative impact on results. However Norwich's position is far from dire they lie 18th but are only three points adrift from 13th placed Swansea albeit with a much inferior goal difference as a consequence of their recent drubbings. Hughton is a canny and experienced coach who is used to managing in far more difficult situations than those he is currently in and frankly there are no obvious better alternatives waiting in the wings. Next week Norwich face West Ham at home and it will no doubt be labelled a must win game. If Norwich win they will swap places with West Ham and in all probability Hughton can pass the baton onto Sam Allardyce who will be managing the new crisis club. At the end of November West Ham will have a must win fixture against Fulham and provided they win that the crisis club is likely to be Fulham Martin Jol then will be facing an uncertain future. The point is that the bottom half of the Premier League is very tight all the teams are a pretty evenly matched and giving a coach a handful of games to save their job is unfair and irrational. At the moment it looks like Sunderland and Crystal Palace will be lucky to escape the drop but the third relegation spot will be a tight run race between anything up to 5 or 6 teams so a few poor results will see a lot of managers looking over their shoulders and boardrooms will be wondering if they need to make a change. The crisis club will change almost weekly and I am sure not all the managers will survive to the end of the season and those dismissed will have the right to feel a little aggrieved.